The United States is reportedly considering abstaining from a potential U.N. General Assembly vote calling for an end to its long-standing trade embargo against Cuba. For nearly a quarter of a century, Cuba has brought forward a similar resolution at the yearly General Assembly meeting expressing concern about laws that affect the sovereignty and free trade of other nations. For the past two years, the U.S. and Israel were the only two countries to vote against the measure. But U.S.-Cuba relations have taken a dramatic turn since the last vote in October 2014. In July, the two governments ended 54 years of antagonism and agreed to re-establish diplomatic relations. Embassies in Havana and Washington subsequently re-opened and President Barack Obama publicly urged Congress to lift the embargo. So far, lawmakers in the Republican-controlled Congress have taken no major steps toward that end, leaving the president to say last week that his administration will look "step by step" for opportunities to ease the effects of the embargo while it remains in place. The Associated Press, citing four unnamed administration officials who would only comment under condition of anonymity, reported Monday that the U.S. would consider abstaining from voting against a new General Assembly resolution on the embargo if the text changes significantly from previous versions. The officials said no decision would be made without seeing the latest version, but that abstaining could be a strong message to Congress about the president's commitment to ending the embargo. Last year's resolution featured largely vague references that do not single out the United States in urging a repeal of laws affecting free trade, but one paragraph specifically mentions a 1996 U.S. law known as the Helms-Burton act. That law has a stated purpose of working to strengthen international sanctions against Cuba, countering threats from the Cuban government and supporting a political transition to a democratic government. One provision allows the U.S. president to cancel the trade embargo if a transition takes place. U.S. envoy Ronald Godard said in dismissing the 2014 resolution that the sanctions are part of an effort to "help the Cuban people freely exercise their human rights and fundamental freedoms." He said Cuba uses the yearly measures to shift blame for its economic problems. 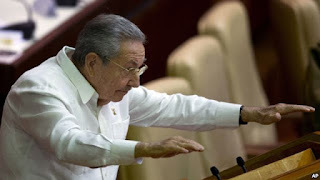 The main portion of this year's General Assembly begins next Monday, and is scheduled to include addresses that day by both President Obama and Cuban President Raul Castro. General Assembly resolutions require only a simple majority to pass, but unlike Security Council resolutions they are not backed by any enforcement mechanism. Pope Francis' visit to Washington this week will consume the city's attention and interrupt normal congressional business for days, as an end-of-month deadline looms to fund the U.S. government and avert a partial shutdown. “Republicans are twiddling their thumbs as we careen closer and closer to a government shutdown,” accused Democratic Senator Chuck Schumer. At issue is funding for Planned Parenthood, a federally funded women’s reproductive service provider. Earlier this year, undercover video was released in which Planned Parenthood officials discuss the sale of organs from aborted fetuses. 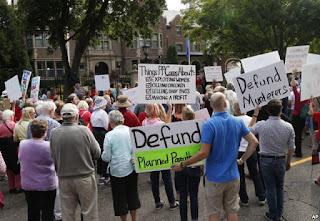 "We should all agree that taxpayer dollars should not be used for harvesting baby parts for profit,” said Republican Congressman Tim Walberg moments before the House of Representatives voted Friday to fund all federal entities and enterprises except Planned Parenthood. "Democrats are ready to sit down and negotiate with Republicans right now,” Obama said in his weekly address Saturday. “But it should be over legitimate issues like how much do we invest in education, job training, and infrastructure -- not unrelated ideological issues like Planned Parenthood. We need to set our sights higher than that." At this point it is not clear any bill that the president would sign, even a short-term stop-gap funding measure, can pass both houses of Congress. The federal government’s spending authority expires at midnight September 30. Although many federal activities would cease, civil servants and military personnel deemed essential would be required to report to work without pay. In past shutdowns, all federal employees were paid retroactively once the government reopened.